Retargeting, also known as remarketing, is a form of online advertising that can keep your brand in front of bounced traffic, even after visitors leave your site. For most websites, only 2% of web traffic converts on the first visit. Retargeting is a tool designed to help companies reach the 98% of users who don’t convert right away. The process is pretty simple – a small, unobtrusive piece of code is placed on your website (this is sometimes referred to as a pixel). The code is unnoticeable to your site’s visitors and won’t affect performance in any way. Every time a new visitor comes to the site, the code drops an anonymous browser cookie. Later, when your cookied visitors browse the Internet, the cookie will let your retargeting provider know when to serve ads, ensuring they are only served to the people who had previously visited your website. Whether your goal is to increase audience engagement, build brand awareness, or focus on customer acquisition/activation, retargeting has proven to be the simplest and most effective boost to many companies’ marketing strategies. However, it’s important to know what you are trying to achieve before you set forth a plan. You may have heard it just a few times before, but this fundamental idea is also applicable in retargeting. Just like in other areas of marketing, content is what ultimately connects you with customers and prospects. It builds trust, especially as some data-driven marketing pushes consumers into very personal and customized experiences. One or two visits to your website doesn’t mean prospects want to start seeing your ads everywhere they browse. Overexposure quickly results in decreased campaign performance, which is why it’s almost always advisable to use a frequency cap. This will limit the number of times a tagged user sees your ads and prevents potential customers from feeling overwhelmed. Be strategic with how and when you serve ads, and take into consideration that not every website visitor will be at the same point in the purchase journey. By continuing to serve ads to converted customers, companies are only serving to annoy people. There’s a very simple solution: use a burn pixel. This snippet of code, placed in your post-transaction page, will untag any users who have made a purchase, ensuring you stop serving them ads. In addition to not annoying your customer, the burn code saves you money. Why waste valuable impressions on the people who already converted? If you’re like most companies, many people who visit your page often put several items in their shopping carts, but do not complete the purchase. Retargeted advertising can help increase your conversion rate by reminding these almost-customers that they liked some products well enough to start the ordering process. Even if you launch your campaign with incredibly strong creatives, running with the same set of ads for months on end will result in a lower performing campaign. After seeing the same ads again and again, a user’s interest is no longer piqued and the ads are more likely to blend into the background. By rotating your ad creative every few months, you can easily avoid experiencing these dips in performance. In addition, simple A/B testing can provide the data you need to run campaigns with high-performing ads. Instead of relying on what you think will work, you can run tests for measurable and actionable results. A/B testing your creatives will help you determine the optimal combination of ad copy, calls-to-action, and graphics. The banner ads you use may do more to determine success than any other factor of your retargeting campaign, so it’s crucial to devote sufficient resources to making attractive ads. Marketers often try to cram as much information as possible into the space allotted. This method of designing banners will only distract your audience and won’t serve the purpose of the ad. Often, creating memorable ads is best achieved by keeping copy at a minimum, and the design simple. 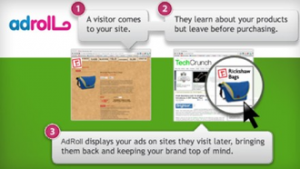 All of your banner ads should be well-branded and recognizable. Use bold colors, concise copy, and clear calls to action with big, clickable buttons. By leveraging data on users’ browsing activity and history across multiple sites, sophisticated user profiles can be created. These user profiles can be defined further by demographic, geographic, and contextual variables, empowering brand strategists with the ability to apply their budget to specific audience groups. This way, impressions aren’t wasted on people who are not relevant to your campaign. Targeting improves relevance and also lowers costs. So now that you have an understanding of what retargeting is, as well as the right elements and pointers to make the campaign work, where do you start? 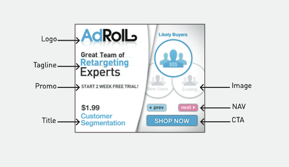 Is there a formula for a successful retargeting ad campaign?? The best starting place is to identify your audience and your objective. Content must reflect who you are trying to reach and why. If this is not established from the get-go, just like any other campaign, retargeting is set up to fail. Exact Market can assist you in determining your precise audience and goals, and easily and quickly work with you toward a successful retargeting campaign. Our professionally-designed templates can pave the way for an effective, easy-to-implement process. 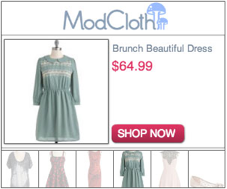 When used properly, retargeting is incredibly powerful and successful. It offers a top-notch ROI, grows brand awareness, and increases the number of new customers your business can gain.